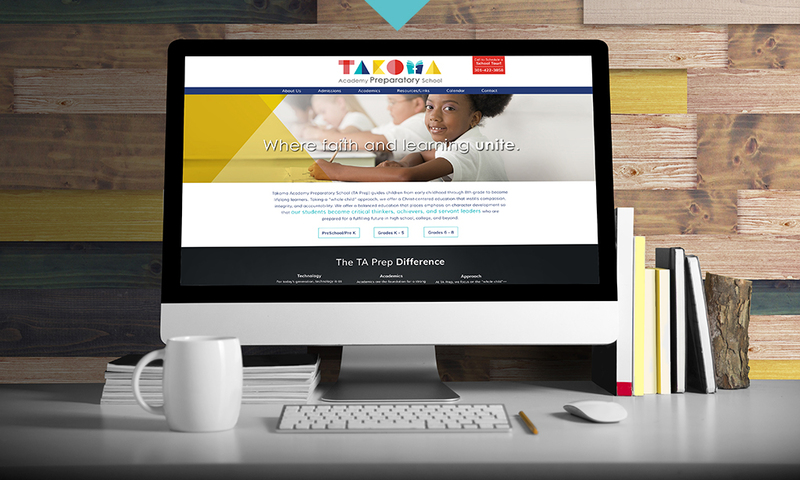 Takoma Academy Preparatory School (TA Prep) came to id8 in 2016 for help in branding their new co-educational elementary school, scheduled to open the following year. TA Prep was going to be a new school developed from a merge between two other institutions in the area. Since this was going to be a new venture between two schools seen as rivals, TA Prep had a few barriers to overcome in addition to creating a new brand. With every project, id8 begins with a Discovery meeting with the client to get a better understanding of who they are, what they see as barriers, and understand their overall goals. Once this information was gathered from key stakeholders involved in the TA Prep project, we started the initial research in the general area, located in Takoma Park, Maryland. We gathered information on competitors within a 20-mile radius and collected insights on staff, students, and families from both schools. We conducted observational research at the different schools to understand the current strengths, opportunities, and challenges from an outside perspective. Interviews and questionnaires were administered to students and stakeholders to gather information on their feelings and perceptions of the current institutions, and understand their wants, needs, and expectations for the new school. Once all the information was gathered, we began to create the Takoma Academy Preparatory School brand. id8 developed the positioning and messaging, a logo, and a marketing strategy for the next year based on the answers we received from our research and audits. With the new logo and brand, we created uniforms, business cards, folders, and letterhead. Brochures, signage, posters, and the website were developed to enforce brand awareness. Since the creation of the TA Prep’s school and brand, enrollment has doubled. They exceeded their enrollment goal of 300 in 2017, and there is now a waitlist for their pre-K program for the 18-19 school year.